According to recent research data presented recently at the 2016 Annual Meeting of the Society of Nuclear Medicine and Molecular Imaging (SNMMI), an investigative blood test could predict how patients will respond to peptide receptor radionuclide therapy (PRRT)—for the treatment of malignant neuroendocrine tumors (NETs)—before they commit to a course of therapy. NETs are relatively rare, yet notoriously difficult to treat, and associated with poor long-term survival. These tumors can develop in a variety of locations where hormone signaling occurs between nerve cells and organs of the endocrine system. However, the most common origins for these cancers are in the gastrointestinal tract, the lungs, and the pancreas. NETs are often elusive due to their rarity and symptoms such as flushing, diarrhea, and sweating is often regarded as unrelated to disease and part of normal life events. Sadly, most cases are not caught until these tumors have already spread to other organs, making them difficult to treat with conventional means. In the early 2000s, researchers established a targeted treatment—PRRT—which zeros in on active peptide receptors that are over-expressed on the surface of NETs. The injected drug binds specifically to these receptors and knocks out tumors by irradiating them with a potent dose of short-range radioactive material while sparing healthy tissues nearby. PRRT has helped many patients and is associated with lower systemic side effects, but not all patients respond to PRRT. For this reason, researchers are working to predict patient response before the start of treatment with molecular imaging. Visualizing the NET receptor activity allows clinicians understand the potential path of PRRT in the body prior to therapy. A number of methods have been used, including somatostatin receptor imaging (SRI), since many NET tumors commonly express somatostatin receptor activity. 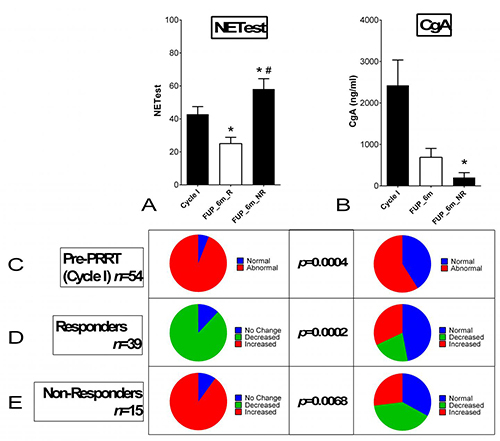 In this new study, researchers are investigating a genetic screen called NETest, which measures the specific NET genes circulating in the blood that appears to define and predict responsiveness to PRRT. “This research shows that the molecular information obtained from a simple blood draw can be easily integrated with radiological and molecular imaging to provide a more accurate assessment of tumor behavior and response to therapy,” explained lead study author Lisa Bodei, M.D., Ph.D., of the European Institute of Oncology Division of Nuclear Medicine in Milan, Italy, and a member of the Molecular Imaging and Therapy Service at Memorial Sloan-Kettering Cancer Center in New York. The investigators were able to show that PRRT led to a 68 percent rate of overall disease control, with median progression-free survival not achieved at the end of follow-up. Moreover, the researchers were able to determine that 73 percent of low-grade tumors responded to treatment, while only half of high-grade tumors responded. Histological grading, SRI, and chromogranin were not able to predict PRRT effectiveness. The NETest exceeded SRI evaluation and predicted both therapy response and non-response. The predictive response index of select NETest genes associated with metabolism, signaling, and grading, was found to be more than 90 percent accurate.